Older Americans aren’t settling for the rocking chair. They’re on the ski slopes, tennis courts, and in swimming pools. And they’re demanding that their doctors treat their sports injuries. The octogenarian was on a mission. 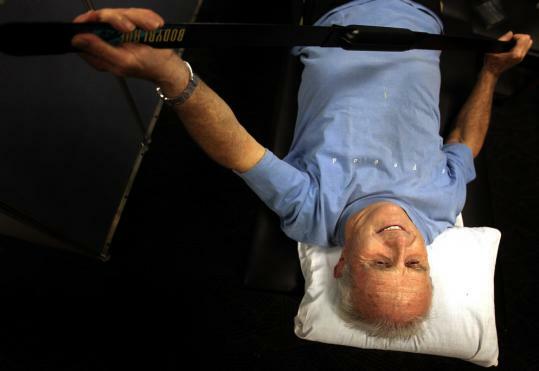 He had torn his right rotator cuff in a fall on the tennis court and wanted it repaired. But Dr. Alan Curtis, an orthopedic surgeon who specializes in sports medicine at Boston’s New England Baptist Hospital, suggested instead a more conservative approach: cortisone injections to ease the inflammation in the injured shoulder muscles that make up the cuff, and then physical therapy. That treatment, however, would not allow the 85-year-old tennis aficionado to swing at overhead balls anymore. “His response was, ‘I’d rather be dead if I can’t play tennis. Fix the damn thing,’ ’’ said Curtis. So they operated. Used to be, orthopedic specialists would rarely see an octogenarian with a sports injury, let alone one who was hankering to get fixed and back to his or her game. But that scenario is becoming more commonplace among older athletes, inspiring specialists and society as a whole to rethink aging, athletics, and the realm of the possible. Between 2001 and 2008, the largest increase in the number of rotator cuff and knee surgeries was among patients over 61, according to the most recent national data compiled by the federal Agency for Healthcare Research and Quality. The steepest increase, jumping from 21 to 28 percent of all such surgeries during that time period, occurred among patients ages 61 to 70 who underwent arthroplasty to repair or replace ailing knees. During the same time, the percentage of patients under 40 receiving knee or rotator cuff surgeries declined. Among the rising number of active elders with surgically repaired bodies is Robert Shea. The 77-year-old Boston-based finance executive loves to jump off cliffs into the ocean and is passionate about his tennis game. But while skiing last New Year’s Eve, zipping down the expert trails in Stowe, Vt., another skier slammed into Shea, who went airborne and tore his rotator cuff on landing. Six months after arthroscopic surgery on his cuff muscles, Shea is still dutifully doing his physical therapy and regaining mobility in his left arm. He’s also back playing tennis — and jumping off oceanside cliffs at his vacation home in Jamaica. Curtis and other surgeons said that, historically, one of the key reasons specialists have been reluctant to surgically repair sports injuries on older patients is that the procedures carry with them a risk of complications, such as from anesthesia, for what are essentially elective procedures. Older patients are more likely to have preexisting heart or lung problems, which can raise the risk of complications. For years, many surgeons balked at operating on patients much over 40 to repair the torn anterior cruciate ligament (or ACL), which provides major knee stabilization and is often injured in high-impact sports. Specialists believed that older patients just didn’t have the fortitude for the months-long healing and rigorous rehabilitation that follows such surgery. But Connecticut orthopedic surgeon Robert Stanton, incoming president of the American Orthopaedic Society for Sports Medicine, said that thinking, too, is starting to change, thanks to the battered baby boomers who are adamant about their athletics. “My indication for what age you can do an ACL reconstruction goes up by one year every year on June 28,’’ said Stanton, a competitive polo player, and avid skier and tennis player, who turned 64 on June 28. For Stanton, knee surgery is a last resort. He estimates that he ends up operating on roughly 2 percent of his patients, and instead is increasingly turning toward less invasive but still highly effective approaches, especially for his older patients. These treatments include injecting lubricants into knees once or twice a year to add cushioning and shock absorption and reduce pain. For many older athletes, a use-it-or-lose-it mentality is increasingly a way of life. The good news for those who keep at it is that the harshest effects of aging on athletic performance don’t show up until after 70, according to research by Dr. Vonda Wright, an orthopedic surgeon at the University of Pittsburgh Medical Center. After years of studying senior athletes, Wright has found that performance declines slowly, about 1 percent a year, between the ages of 30 and 50, and then by about 2 percent between 50 and 70. “After 70, something does take over, the cumulative effect of aging or maybe just not trying as hard, and performance declines about 8 percent per year,’’ Wright said. But even then, she said, a proper mix of aerobic, flexibility, weight, and balance training for athletes can help with performance and especially to ward off injuries.